The RNA Society/Scaringe Awards recognise outstanding achievements by young investigators and aims to encourage the best and the brightest to continue contributing to the field of RNA science. Max is one of three recipients of the award this year: two awards have gone to graduate students and one to a post-doctoral scientist. 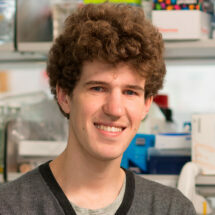 Max has been highlighted for his work on the spliceosome, a dynamic RNA-protein complex that removes introns from mRNA precursors (pre-mRNA) before translation into proteins. He has been involved in understanding the structure and function of multiple yeast splicing intermediates by electron cryo-microscopy. In particular, Max’s work on the ‘P complex’ structure shows that the 3’ splice site (the end of an intron) is recognised by pairing with the 5’ splice site (the start of an intron) and the branch point adenosine. The structure of the ‘P complex’ showed, for the first time, how intron/exon boundaries are recognised with only a very small number of conserved nucleotides near those sites, solving a long-standing mystery at the heart of the central dogma of molecular biology. Max received a Cambridge-Rutherford Memorial Scholarship in 2014 and a Trinity College Krishnan-Ang Studentship for overseas natural science students in 2015. He has been a member of the RNA Society since 2016. In 2018, Max was awarded the LMB’s Max Perutz Student Prize, for outstanding PhD work. Max receives a plaque and cash prize, and invitation to the RNA 2019 conference, held in Krakow, Poland on 11-16 June 2019. He also receives a one-year complimentary membership of the RNA Society and is invited to write a review or mini-review for RNA, the Society’s journal.